Rings can be as simple as a round band of metal to very complex pieces, with a multitude of set stones. My favorite type of ring are wide bands with or without set stones and stacking rings. So my first tutorials in this category will reflect that. We have forged, stamped, fused and foldformed rings, some are geared towards beginner students and some are for students with more experience with torch use. Check the tutorial “sterling silver Anticlastic ring with natural gemstone cabochon”, it was one of my bestselling class at the Bead & Button show in Milwaukee. An anticlastic shape is one that curves around two axes, the best example of this shape is the surface of a saddle. Anticlastic shapes are structurally rigid but light weighed pieces, making them ideal for jewelry making. This project will introduce you to anticlastic raising, which tools you need and how to use them to shape a beautiful one-of-a-kind ring. The wide adjustable band of the ring shank is perfect for stamping or hammering lots of texture! 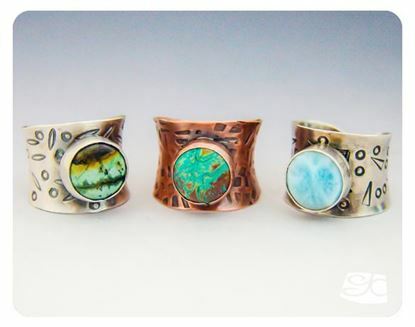 You can make the ring in Silver or copper, copper looks special good with green stones. The use of a calibrated stone and pre-made commercial bezel cup makes this a good beginner’s soldering project. This was a best selling metalworking class at the Bead & Button show. The small anticlastic stake and mallet combo, the soldering locking head & shank tweezers, calibrated cabochons & bezel cups used in this tutorial are available for purchase in the tools & materials area of the website. This tutorial is an instant downloading PDF file. it is 8 pages long and has 19 photos.